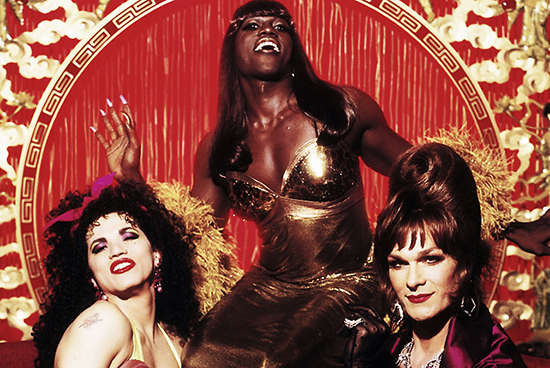 Sweet transvestites from Transsexual, Transylvania and super fab Queer Queens! (SPOT.ph) We’re a little late for Pride Week...or a little too advanced for next year’s celebration. Pride can’t possibly be seasonal though. Every day is a chance to raise a middle finger to silly conventions and conformity. It’s a bit queer that most transgender roles still go to straight males (or females, as in Trans America) but a little bit of progress can go a long, long way. In any case, we’ve put together this flamboyant list of fabulous drag queens for the brave men (and women) who challenge the way we think about sexuality. Hurrah for diversity. Third person female pronouns are used to refer to the transgender identity in this article. Torn between loving Edilberto (who was married to her best friend, such tragedy) and Ichiru Hamaguchi (the enemy, for more tragedy), the lovely Inya struggles with her feelings as a war rages on. Her romantic dilemma reminds us of that ever-so-familiar tune, "The One Who Loves You" by Glenn Frey. Sadly, her choice to go back to the one who loves her proved fatal and the star-crossed lovers became casualties of war. 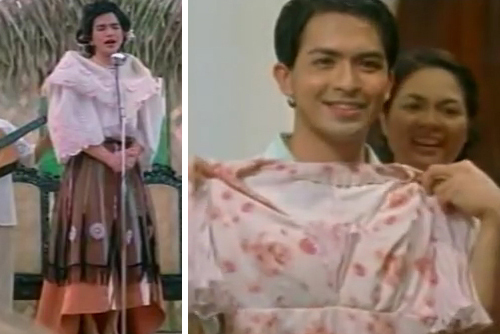 Inya’s story may not be one that ends happily, but with Dennis Trillo’s cheekbones, she looked fabulous throughout her ordeal. The heartthrob of El Morro, who smuggled things up her...you know what. Her trade may seem distasteful (they were in prison, get over it) but Reinaldo Arenas said that when she walked by, she made people feel like they were in the movies. It’s only right that she be portrayed by Johnny Depp in the film adaptation of Arenas’ autobiography. Depp made her look glamorous-with a soul patch. Quite frankly, in the film, her bottom looked absolutely soft and smooth. Level of fabulosity: Don’t hate me ’cause I’m beautiful. The film is a little hard to follow, so we’re very glad that they cast Gael García Bernal. We don’t care what he does, we just like looking at him. Through him, we learned about Che Gueverra’s younger years (he was also Che in Fidel) and the crimes of Padre Amaro. Men with perfect faces should follow his example and use it to benefit mankind by making movies that nourish the brain (although they are somewhat depressing). In Bad Education, Bernal plays a role within role. He’s a seductress of sorts and it’s unnerving how well he plays these characters. Keep educating us, Gael. Use your beauty to intellectualize us. We don’t mind at all. 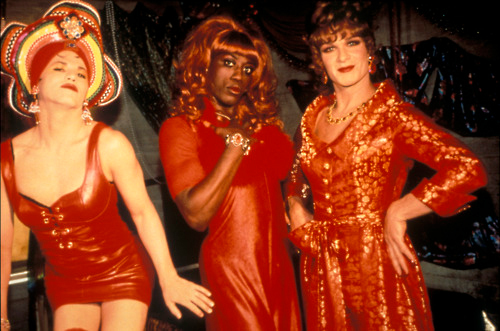 Noxeema Jackson famously explained: "When a gay man has way too much fashion sense for one gender, he is a drag queen." We don’t feel guilty putting a three-way tie in this entry because after all, a double win is what set the story in motion for these three visions of beauty. En route to claim the Drag Queen of the Year title in California (and to deliver a message to Miss Julie Newmar), our dressed-to-impress heroines get stranded in Syndersville, a town that can’t handle their lovely personalities. Ignoring adversity (an utter must if you want to be fab), Noxeema, Vida, and Chi-Chi prove that the right attitude is the best thing one can wear. 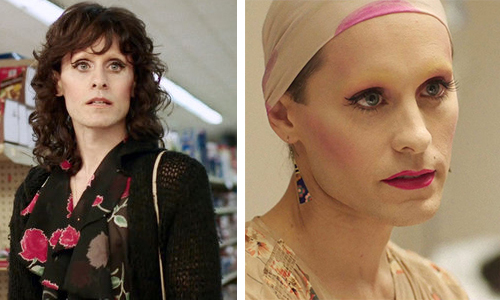 Oh, Rayon. You were, in all likelihood, a wonderful human being who enjoyed life. Sadly, sometimes people make terrible decisions in pursuit of happiness. Some people said that Jared Leto portraying you was not a good decision too, but he’s so damn pretty. We actually forgot he was a "he." It was this or John Skillpa/Emma from Peacock. 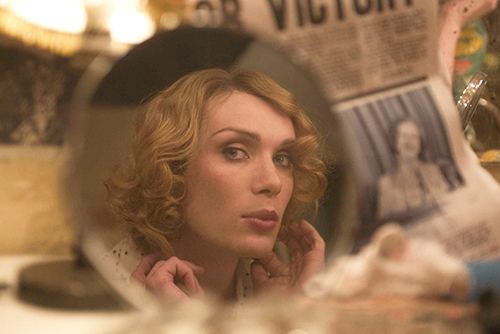 We have accepted the fact that the only way we can be as pretty as Cillian Murphy is through surgery. The man is a blonde bombshell in this film, playing a character with tremendous depth. Kitty Braden’s story runs parallel with political turmoil, but her spirit cannot be broken. She is a strong individual, and her story reveals a character that transcends labels associated with sexuality. The only reason we don’t break down and cry whenever we remember that Angel does not make it to the end of the play is that we imagine she’s singing and dancing in heaven. She’s fictional, but she touched us deeply. Even though she had AIDS, she was bursting with love. Quite terrible that she had to go while all the other bickering people in the story went on to live. She offered shelter! She’ll be your coat! She’ll cover you! Level of fabulosity: Blooming and booming. 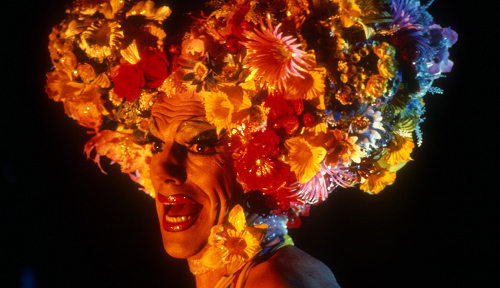 In the desert (duh), Hugo Weaving put this crown of flowers on and sang Gloria Gaynor’s anthemic "I Will Survive." The sparkling ruby red lipstick and the exaggerated eye makeup always inspire us to make bold choices in life. Our only real complaint is that there just wasn’t enough singing in this film. We love Terrence Stamp and Guy Pearce too, but Weaving’s commitment to the role gives us goosies. Minx has dubious philosophies in life. She loves herself, but maybe a little too much? She likes fame, she likes money (it’s the best medicine), and she likes talking in this fake Scandinavian-ish accent. For 10 minutes, she conducts a dialogue with an unseen audience in different wigs and costumes...gradually unraveling as we learn more about her life. We like Minx because Jude Law is enough reason to like anything. 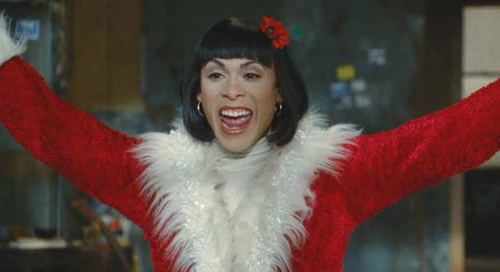 Really, we’re not sure if she’s a drag queen or an actual female. We think that’s the point. 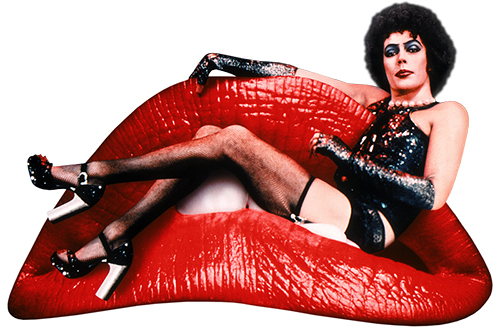 Nobody really understood Dr. Frank N. Furter when she strutted her stuff back in 1975. There’s nothing humanizing about her-she’s imposing and frightening, probably exactly what people see when they think of a transvestite. But we adore her. She’s unapologetic. She confronts people with her presence. Thick heels, lush lips, and an in-your-face attitude? She was fierce before fierce was even conceived as a concept.